Annnnnd starting to get Pat's cold. Awesome. Skipped ballet as my cold was reaching a crescendo. I firmly believe that you can exercise your way out of sickness. I mean, to a degree. Depending. So I got up and did my run, albeit gently. Maybe it helped a little? Still not 100%, but I took a shot at ballet anyway. It went okay. 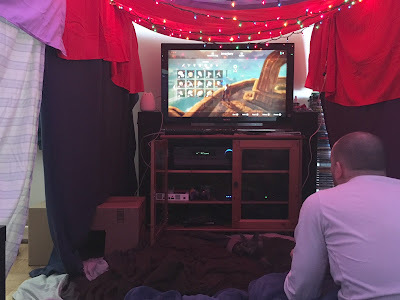 Nothing to report on the Disney front, but Pat and I made a blanket fort this weekend, so that was awesome. Why, yes, that IS the new Zelda. Thank you for noticing! And now: The Twilight Bark! - Fairytales & Fitness lists ways to save your run when you're not feeling it. - Sparkly Runner takes on the Castaway Cay Challenge 5K. - The Runner's Guide to WDW shepherds us through signing up for a runDisney challenge. - The Main Street Gazette highlights Sinclair and Pixar's Dinoco. My grandfather used to own a Sinclar gas station (a great name in oil!!) and ALSO HIS NAME WAS STANLEY. - easyWDW reviews every booth at the flower and garden festival and basically what I'm trying to get at here is I want his life and I'm Crazy Go Nuts University excited for Epcot in April. - Rolling with the Magic offers a more general overview of the Flower & Garden Festival. - WDW for Grownups points out Magic Kingdom attractions that have stood since 1971. - Disney In Your Day has a super-cute Disney Madness bracket going. - Living A Disney Life considers WDW things that are enjoyable against all odds.